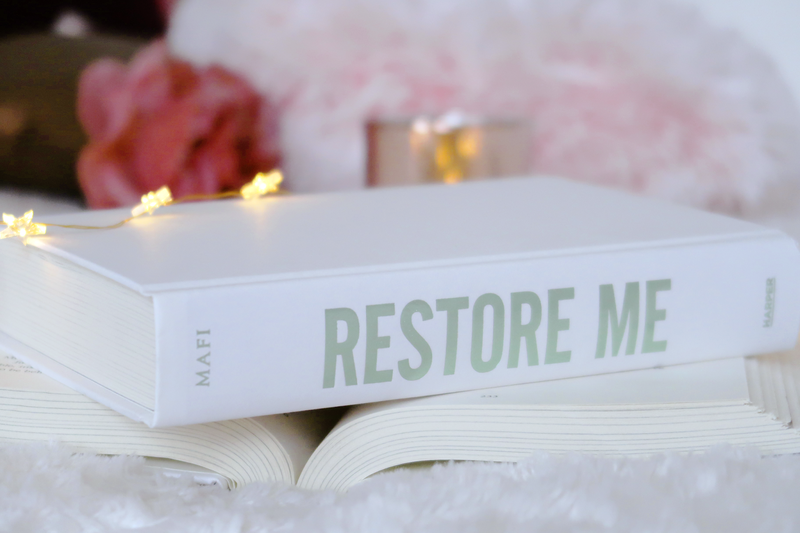 The year is coming to an end, and I'm already way past my reading goal of 150 books. I've read a lot of different types of books this year, from Adult contemporary to Middle-grade fiction, and there's a few that stuck out for me. I'll talk more in-depth about my favorite books that were published in 2018 on my youtube channel here (video coming later this week! ), but there are some books I've read this year that weren't published in the last 12 months but deserve a shoutout nonetheless. Without further ado, let's get into 10 of my favorite books that I've read in 2018! I discovered the existence of this book when scrolling through an artist's instagram, and decided to pick it up. The description for this sounded intriguing, a perfect mix between a romance book and a young adult fantasy one; the two genres I gravitate to most. Trick follows Briar, the princess of the Autumn court, who falls in love with a court jester from Spring named Poet. Poet, however, may not be all that he seems, because he is guarding a secret that would cost him his life. This story took me by the throat. The story in this is so incredibly soft I HAVE to recommend it to anyone I meet. The secret poet carries around is wholly unexpected. The writing is beautiful and whimsical. This book deals with a subject that is barely written about in Young Adult literature, and especially not in a setting like this. Trick deserves all the praise it can get and I'm surprised this book isn't more well-known in the book community. What a great find! I know what everyone's gonna ask; have I been living under a rock? The Lunar Chronicles series has been around for so long but I had never come to finishing it. I started Cinder (#1) when I was in high school (around 2012) and then never bothered to pick up Scarlet (#2). Biggest. Mistake. Of. My. Life. These books each respectively follow their own fairytale retelling set within the same universe; a dystopian world filled with sci-fi elements and cyborgs. The protagonists of each book interact over the span of the whole series and each get their own POV's. The thing I loved most about this series that is on the longer side (5 books and a novella + graphic novel!) was seeing these characters develop over the scope of all these books and interacting with each other. My particular favorite dynamics are Cress & Thorne and Cinder & Kai. But, I have to admit all of the characters are great. Meyer knows how to write long series without dragging out the plot-lines. I loved every minute of this fairy-tale inspired adventure and I'm already planning my next reread! Stalking Jack the Ripper is a series I initially didn't think I would care about. I thought it'd be a crime-series set in an overdone time period with an overrated historical scenario. I couldn't be more wrong if I tried. Stalking Jack the Ripper focuses on Audrey Rose Wadsworth, who is disguised as a boy to study forensic medicine. When she hears of the 'Ripper Murders' that are happening in- and around London, she feels the need to take action. Together with her classmate, and overly cocky friend, Thomas Cresswell, she sets out to find the serial killer who calls himself Jack The Ripper and tries to stop him from wreaking havoc. The characters in this is what made the book for me. Audrey Rose and Thomas are incredibly likeable as characters. The mystery-element is a nice touch, though kind of predictable. As said earlier, I'm not a huge fan of mysteries, but these books 100% worked for me. Now, for something different, Fence is an ongoing comic series created by the writer of the Captive Prince series and one of my favorite independent artists. When I heard of this collaboration I immediately had to get my hands on these issues. Fence combines Pacat's love for sports anime with her love for storytelling. The story is set around an elite boys school called Kings Row, where Nicholas Cox joins the fencing team. Nicholas meets friends, foes (a prodigy boy named Seiji) and has to try his hardest to make the fencing team. The thing I love about this story is its diversity. Though set in an all-boys school, it has LGBTQ characters, relationships and a diverse cast of characters. Because of the comic format, they're really easy to get through. I always find myself eagerly anticipating a new issue. Like I said, the art in Fence is done by Johanna the Mad, whom I followed before she even started working on this. Her style is influenced by Disney as well as Japanese manga which creates such a beautiful comic. I truly love everything about this series! The Gentleman's Guide to Vice and Virtue is a book I will probably never shut up about. What a wild, hilarious and unique ride this book was. This story takes place in Victorian England and follows a British boy named Henry "Monty" Montague. Monty is done with etiquette and wants to leave the confines of his strict home to travel Europe with his best friend Percy. Together with his sister Felicity, they embark on a trip of debauchery and endless gambling. I whole-heartedly loved this book. The love-story between Percy and Monty was incredibly soft, such a joy to read. Monty's character is a mess at the beginning, but you just can't hate him. You can't. (Percy, you're an angel, always). If you're looking for an incredibly detailed, historically accurate Victorian fiction novel, this might not be your thing. However, if you're looking for a lighthearted, but carrying serious undertones, Young Adult novel that will make you laugh-out-loud and roll your eyes a few times, this is absolutely something you should pick up. What a delight. All for the Game is one of those series I kept seeing on my Tumblr dashboard and my Twitter feed. I wasn't sure what to expect at first, but ended up enjoying SO MUCH, which is mostly due to the characters. All for the Game focuses on a group of misfits that all form the Palmetto State Exy team. If you're now asking yourself if you're stupid because you've never heard of Exy, you're not, it's a fake sport completely made up by Sakavic, however I imagine it's kind of like Lacrosse. The book mostly follows Neil Josten, a homeless boy who accidentally ends up joining the team, and his journey with the Foxes (their teamname). This book is the definition of the found family trope, which is one of my all-time favorite tropes, and will make you feel warm. Be careful and check trigger warnings before reading this series though, because the books don't deal with light-hearted subjects! Red Winter is another one of those underrated series I barely see anyone talk about but deserves more hype. It is set in Japan, and deals with Japanese mythology. It follows kamigakari Emi who is set to ascend so that a goddess can take her body. After wandering around in the woods, she ecounters fox spirit Shiro, whom she rescues from mortal danger. Shiro now owns her a favor and won't stop until it is returned. The world-building in this is absolutely amazing. I'm fascinated with any type of mythology so this book fit right up my alley. I found it fascinating to read about the culture and made me want to know more about it. The characters in Red Winter, in particular Emi, were all so well-written and layered. ALSO, not unimportant, THIS BOOK HAS ART INSIDE IT! Yes, that's right, every time a pivotal plot-moment happens, there is a gorgeous accompanying image in the book. In short, this book has everything you look for, so check it out. It deserves a lot more hype and recognition! A book that came out this year and has been on my most-anticipated shelf for a good part of 2018 is Mirage by Somaiya Daud. This Moroccan inspired fantasy (with a gorgeous cover!) features two girls who look exactly the same. Amani is kidnapped by the regime and taken to the royal palace to be a decoy for her doppelgänger the cruel princess Maram. Amani has to navigate her new life at court, while pretending to be someone else. Life at court knows a lot of dangers, and one mistake could cost her her head. This awesome fantasy novel lived up to every expectation I had. I loved the story, the level of political intrigue, as well as the characters. The second instalment is expected to be released in 2019 so I'm eagerly anticipating the sequel! Surprisingly the only romance book that made this list, but a very very good romance book nonetheless. This won the Goodreads award for best romance this year, which is very very unsurprising. It is no secret I'm actually obsessed with this book and these characters. Stella and Michael have the cutest relationship ever. The book deals with subjects that are rare within the romance genre, and the fact that some of these subjects are inspired by Hoang's real life make this book all the more powerful. I love this, okay? Read it, please, thank you. The last book I want to address in this list is a very hyped one. In fact, The Cruel Prince is probably one of the most popular 2018 releases. This book is about Jude, a human who due to a tragic thing that happened in her past, is now living in a High Court of the faerie kingdom. Jude feels like she doesn't belong there, which is due to the treatment of the other Fae. She is being bullied and ostracized by the people around her, and worst of them all is the cruel prince Cardan. When Jude learns what really goes on in the court, a lot of political intrigue ensues. I didn't initially like this book. I only really liked Jude, but Cardan? I didn't understand what the hype was about this boy. He was mean, and evil, and unapologetic. Truth is, I still don't really like Cardan that much. He isn't a character I would go for, and I still think that the hype for him is a little too much. He's kind of a mess of a character. However, I love Jude. Love her. Her character is worth 5 stars for me alone. If you like Fae universes with a dash of political intrigue and some morally grey characters, this is probably something you'd enjoy. Who knows, you might love Cardan after all! I've read a lot of great books this year, and there's so much more I wanted to put on this list. I've put most of my favorite 2018 releases on my Youtube channel, so if you want you can take a look over there. All in all, I'm looking forward to a new year of even more book releases and a new reading challenge in 2019. Prior to reading this book, I really, genuinely, thought that this would be the last Cassandra Clare book I'd ever read. Despite reading all of them, I wasn't a fan of the The Mortal Instruments series when I read them as a teenager, but her The Infernal Devices series is one of my all time favorite fantasy series. Her characters, and especially her storylines, are a hit or miss for me. Hence why I swore that The Dark Artifices would be my last Cassandra Clare series, ever. Queen of Air and Darkness is the third instalment in The Dark Artifices series, and follows the Shadowhunters of the Los Angeles institute. If you're not familiar with Clare's enormous universe; it basically centers around a group of "Shadowhunters" who hunt supernatural creatures to make sure the peace between humans and "downworlders" is maintained. This series in particular is set in Los Angeles and focuses on a significantly large cast of characters (some older faces from her previous series set in the universe, but also some newly introduced ones). The plot of Queen of Air and Darkness begins where the previous instalment Lord of Shadows left off. With one of his siblings gone, Julian has to navigate his feelings of grief, as well as his complicated relationship with his parabatai Emma Carstairs. Together with their friends and family they have to prevent the Shadow World from succumbing to a dark power. "Some lights were never meant to burn for long." What did I think about Queen of Air and Darkness? Okay, so, I can swallow my pride and say that I was wrong to go in with such an attitude. I was so ready for this to be the last Shadowhunters book I'd ever read. I was very ready to leave this world behind. Ever since reading the series in my teenage years, I've felt too little of a connection to the TMI characters, same as I've always felt too large of a connection towards the TID characters. Due to this large contrast, I've always felt Clare's other characters to fall a bit flat for me. Because I'm still so in love with the TID books, I wasn't sure I'd connect with any of her newer characters. I was convinced she'd already peaked with her previous series. The universe just kept expanding and expanding and I was tired of it. 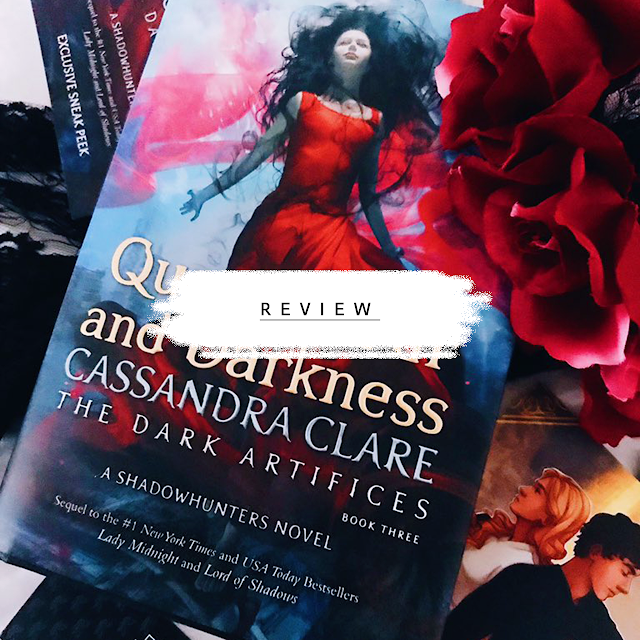 I've read the previous two books Lady Midnight and Lord of Shadows back to back last year, and I didn't really remember much of them prior to reading QoAad. I didn't recollect the plot at all, and, especially minor characters, were a blur. However ready I was to feel indifferent about this book and move on, I didn't. I picked this up in the hopes of reading about cameo's of my favorite Infernal Devices characters, and ended up LOVING it. It's no secret I always enjoy conclusions to book series; they're often the most action- packed and gratifying (with the exception of open or sad endings, we don't talk about those). Within the first few chapters, I already loved how fast-paced and exciting this book was. The balance between character moments and action scenes was well-proportioned, dare I say, perfectly done. Despite my expectations, I didn't feel myself getting bored of the action and plot throughout the, almost 900 page, novel. The romantic storylines were very nicely intertwined with the larger action plot, providing a nice break from the heavy stuff. Clare's writing does feature a lot of extensive descriptions, but they didn't necessarily bother me. She also has an almost 'formal' writing style at times, which I do really like and I find is able to add to the setting of the Shadow World. Plot-wise, I enjoyed the personal relationships and character-driven subplots the most. There were times when I wanted to throw my book at the wall (Julian Blackthorn, looking at you, sir), and wanted to yell in joy (Jem announcing him and Tessa are having a baby! UGH, perfection!). I'm happy that most of the drama was resolved in the end, and the drama that wasn't will be focused on in future books. The only book I have ever cried reading is Clockwork Princess, but I almost shed a tear during the beginning of this book. The first half was heavy, and I mean... really d*mn heavy. However, the tone doesn't remain the same throughout the complete novel. There are jokes that are almost 80% funny (I just have a very particular sense of humor so they were only 80% funny. It's me, not you), as well as cute character moments. It was also nice to see old characters from previous books reappear again. It's no secret that I think Jem is the best character Clare has ever written, and to see him and Tessa make a few appearances aside from his short stories in Ghosts of the Shadow Market was a real treat. The way the book ended in regards to him also satisfied me enormously, since I'm a huge fan of the particular trope and I can't wait to see what he's up to in The Wicked Powers (2022). Compared to her first series, you can see the books have evolved in terms of diversity. The Dark Artifices includes a transgender woman, many LGBTQ+ relationships, a polyamorous relationship, as well as characters of various ethnicities (Latino & Asian, to name some) I don't think the representation is 100% perfect, but then again, there is no such thing as a perfect book. However, I thought it was worth noting. I don't know whether it is because I had zero to no expectations, or because it was just that good, but this book was a solid 5 star read for me. I guess I'm gonna be sticking around for the next 20000 books after all.